I was dissatisfied with the circular visual field and even more unhappy with the image quality through the binoculars. 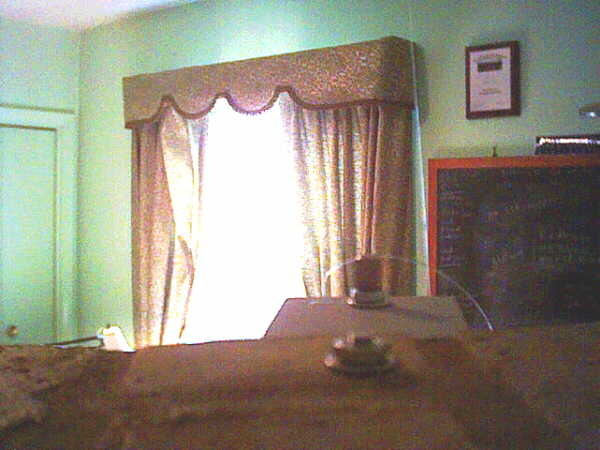 So in March 2013, I managed to disassemble (destroy) the RCM-8164 webcam and extract the circuit board (containing the imager). 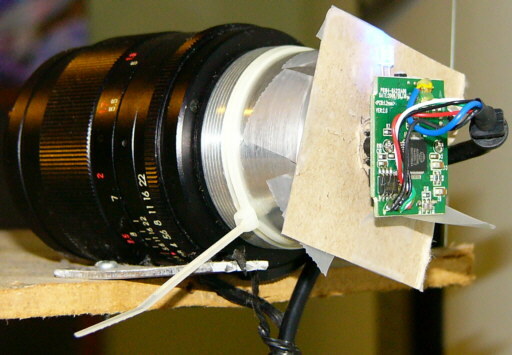 With the webcam lens removed, I mounted the board behind a 100mm screw-in lens I used to use with an old Pentax SLR camera. 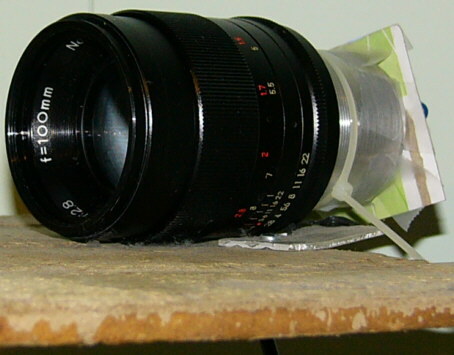 Lucky I had a macro extension sleeve; so with a little cardboard and scotch tape, it wasn't too hard to attach the imager to the lens. The focal length adjustment on the lens works fine, but it still is kind of tough to focus using the hanging string assembly. Also, this lens zooms in fairly high making it harder to maintain a stable image while adjusting the focus. It's not as sharp as I'd like it to be -- I'm guessing it has something to do with the magnification (plus it's looking through a window/storm window at an angle). I might try using a 55mm lens instead which will probably show the whole feeder in the view (yes, that's what is there now!). Prior to April 2010, I was using a pair of 7x35 binoculars. Software: Currently the video streaming server is Yawcam. It also serves up still images like its predecessor. 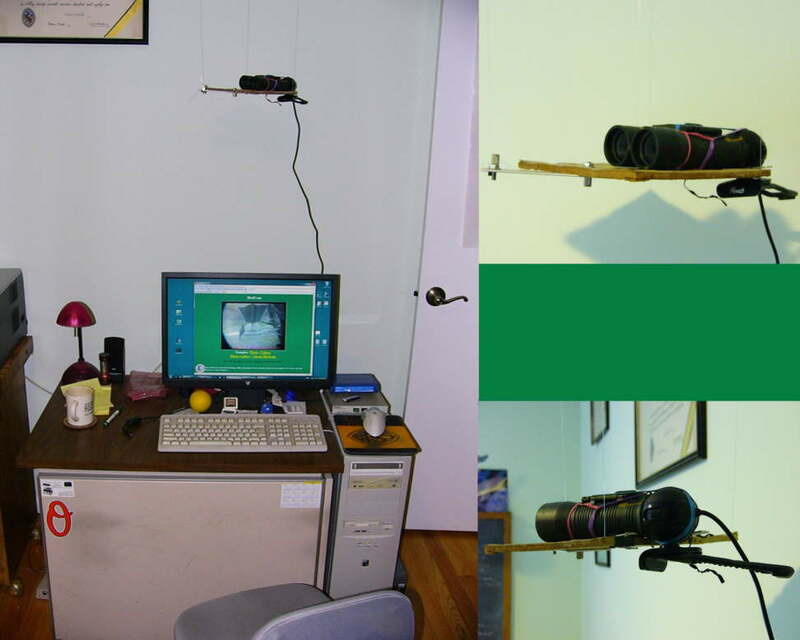 From March 2002 to April 2010, I used Webcam2000 which served up an image at a time. 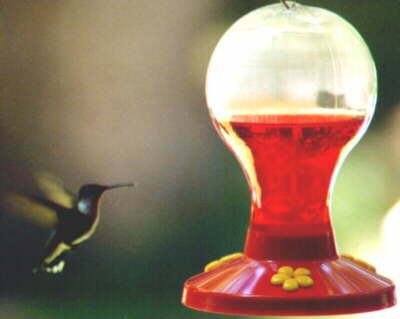 The Main Feeder contains black oil sunflower seed, with four perches and a tray. It holds about 25 lbs., which lasts 6-8 weeks. 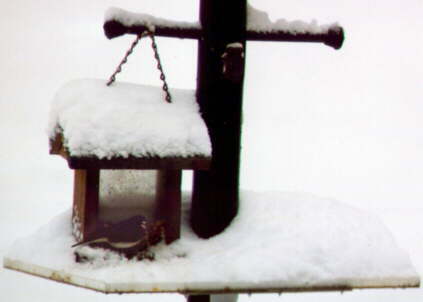 The perches are used mostly by chickadees, titmice, finches, downy woodpeckers, and nuthatches. They are sloppy and some seeds fall onto the tray below, which is mostly used by cardinals (in the photo), doves, juncos, and finches. 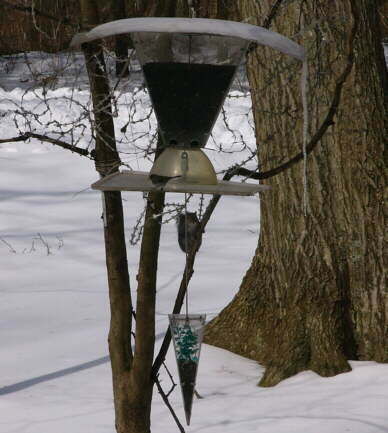 The bottom section sometimes contains suet, which is mostly used by downy woodpeckers and red bellied woodpeckers (in the photo), though nuthatches and wrens visit it as well. The razor wire draped around the dogwood tree discourages the squirrels from jumping onto the tray. In 2014 I removed all of the razor wire and instead put a few plexiglas panels on the tree. 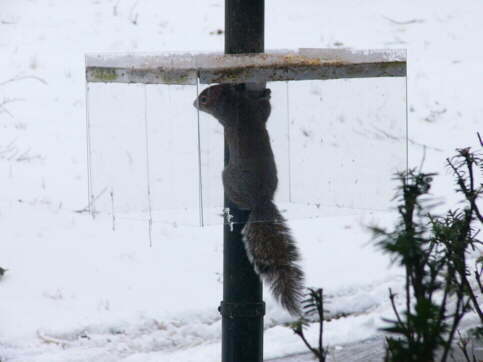 The squirrels can gaze longingly at the feeder through the panels, but cannot get around it to jump onto the tray. 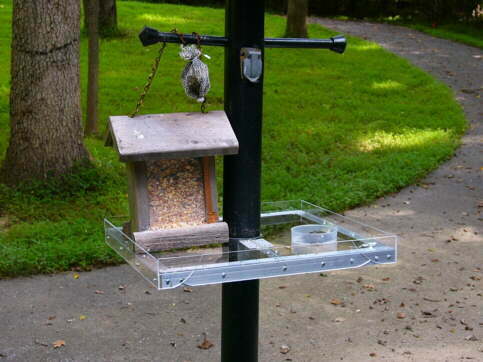 The feeder's roof overhangs the tray so squirrels cannot drop off the top to it -- they must jump across from the tree. The tray is mounted on a pulley, using the bottom section (filled with aquarium rocks) to just balance its weight. Squirrels jumping onto the tray weigh much too much, and immediately fall off. The tray edges are spring loaded so squirrels can't grab onto them, either. 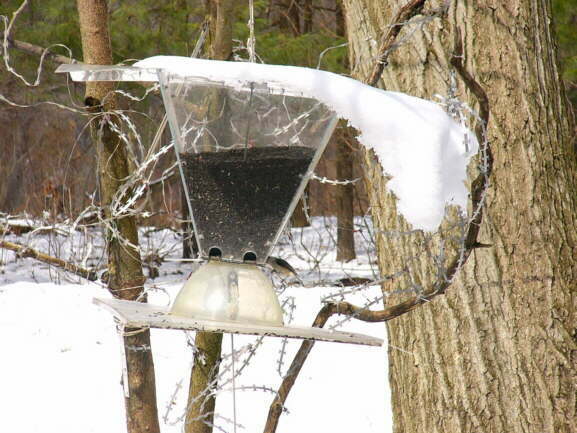 The geometry of the feeder top section is such that there is nothing for squirrels to grab onto. A more detailed description of the Main Feeder, along with additional photos and construction details is here. 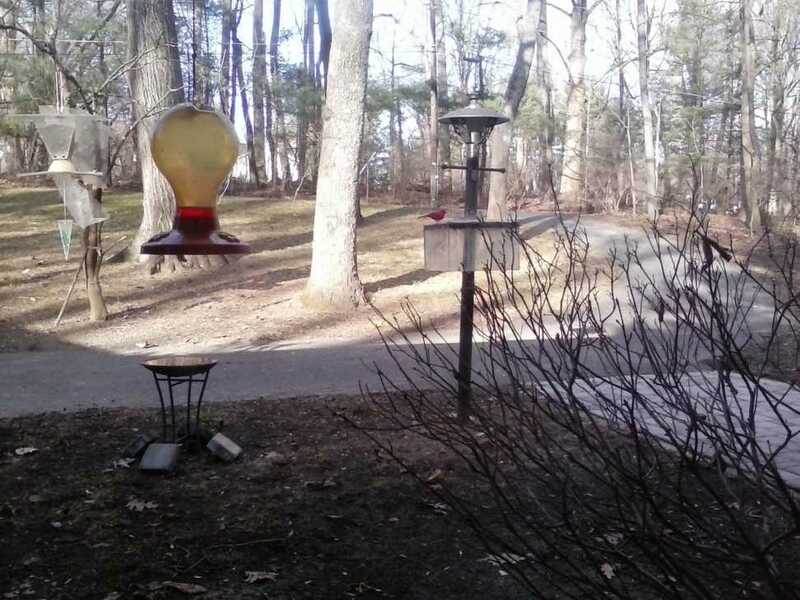 The Post Feeder surrounds the lamp post which prevents the squirrels from climbing up the post onto the tray. Mixed feed is in the birdhouse shaped feeder and spread around the tray, and nyger thistle is in the separate compartment on the right. 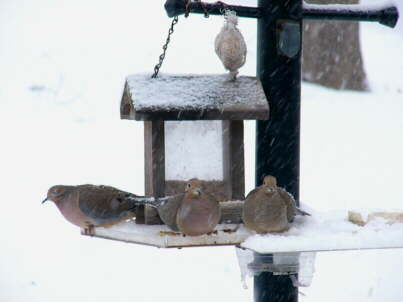 Used mostly by juncos, sparrows, doves, and bluejays. Still, some squirrels figured out how to catapault themselves underneath from the post onto the shelf. The latest incarnation extends the sides, which does successfully prevent them from reaching it. 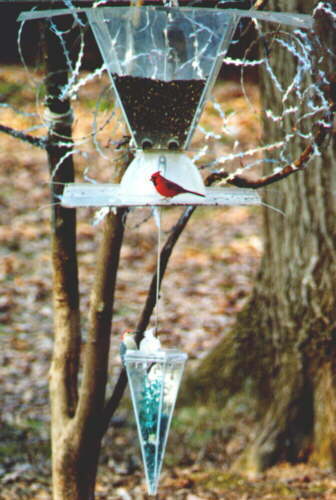 A more detailed description of the Post Feeder along with construction details is here.